I think I must have been around 14 or 15 when I first discovered tarot cards. I don't remember exactly how I stumbled upon them while exploring the Internet that time but I knew that I wanted them. And on my family's next holiday to KL, I found them in a bookstore. They were arranged in large boxes with intimidating art depicting angels, angry looking suns, and strange symbols which I had never seen before. At the time, I believed that Tarot cards worked just like the Ouija board. If you use it, you can get possessed. I laugh at it now, but my head was filled with stories about witches, werewolves, wraiths and the like. And so, I just stared at the tarot decks before me. Afraid of taking one off the shelf in case I get inadvertently cursed or possessed. Fast forward 10 years and you now have a woman whose mind is still filled with fantastical thoughts of witches, werewolves, wraiths, and curses. The only difference is, she has a job, discovered #yolo and has decided that if she's gonna be cursed then so be it. 10 years later, I have more knowledge under my sleeve and know how to better use the Internet to my benefit. I also thank social media (ahem, Tumblr) and my job for opening my eyes to the wonders of tarot (and online shopping). Here are the 5 places (plus 2 more) you can purchase your very own tarot decks in Malaysia, both online and offline. 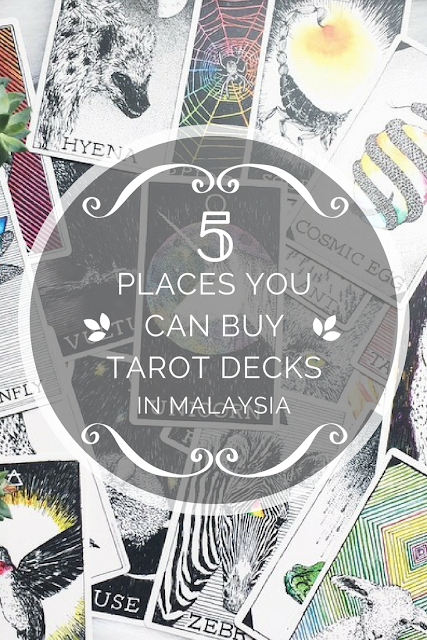 This is by far one of my favourite places to buy Tarot cards in Malaysia. In fact, 3 of my favourite Tarot decks come from Kinokuniya. The online store has more varieties available for purchase. While they are labelled as "Out of Stock", you can always pre-order them from the site. You just have to wait a little longer for your deck to arrive. 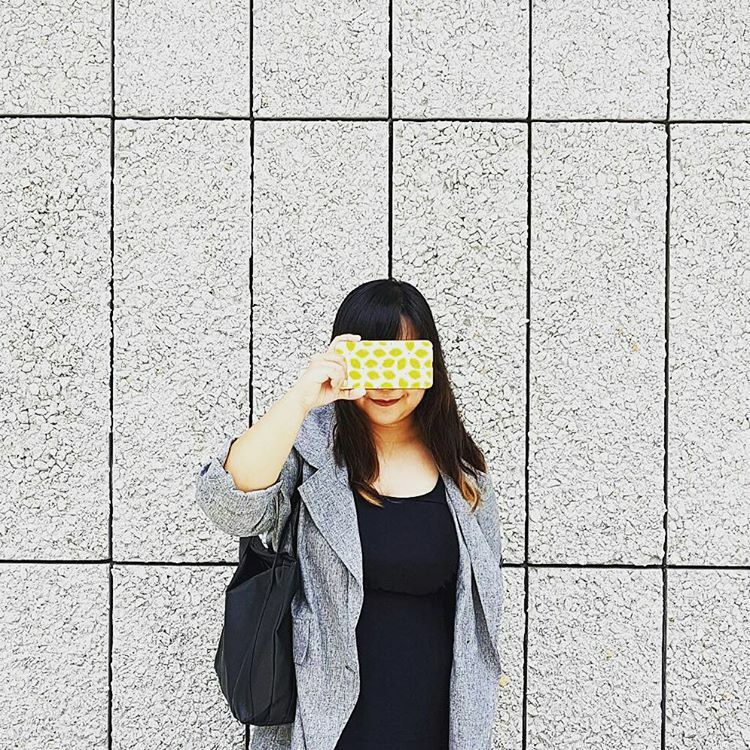 On average, it takes about 1 month for a deck to arrive if you pre-order from Kinokuniya. You can pay for them with both credit and debit cards. COD is not available. 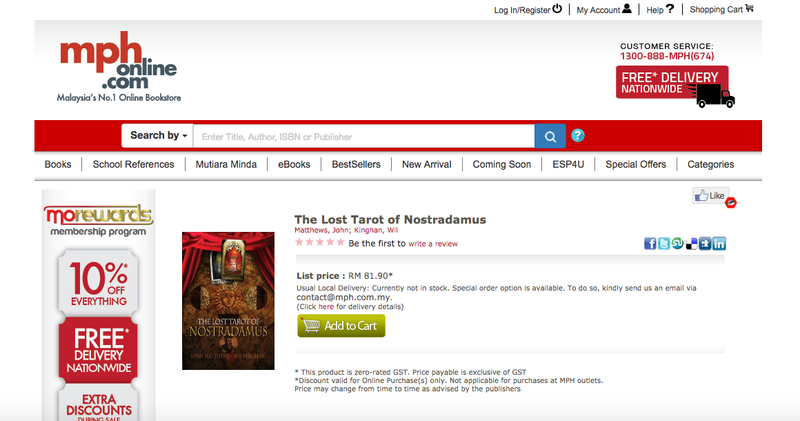 You can also find tarot decks in the Kinokuniya store at KLCC. There are limited choices available, which is why I prefer to order them online. Visit their website, here to check out their selection. The MPH bookstore is where I first saw my tarot deck all those years ago. It was at the large MPH branch at Mid Valley Megamall. 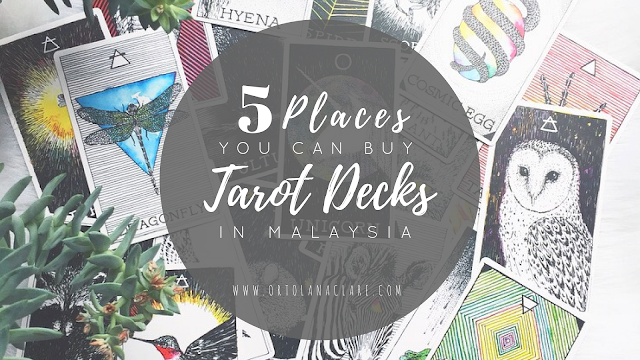 While the Mid Valley branch has shrunk considerably and moved their premises to a new location in the mall, they still have a small selection of Tarot decks available the last time I was there. Alternatively, you can order them online from their website but the selection is also quite limited. 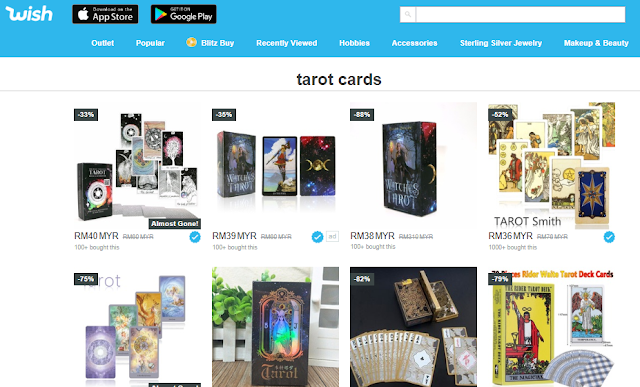 Lazada is definitely a good place to start if you're looking for a cheap knock-off version of popular Tarot cards like the Classic Rider Waite Tarot decks and the Shadowscapes Tarot deck. I will be the first to say, getting a cheap deck that's less than RM50 is a great way to start. These decks are basically carbon copies of the originals except some of them might have some Chinese on them. 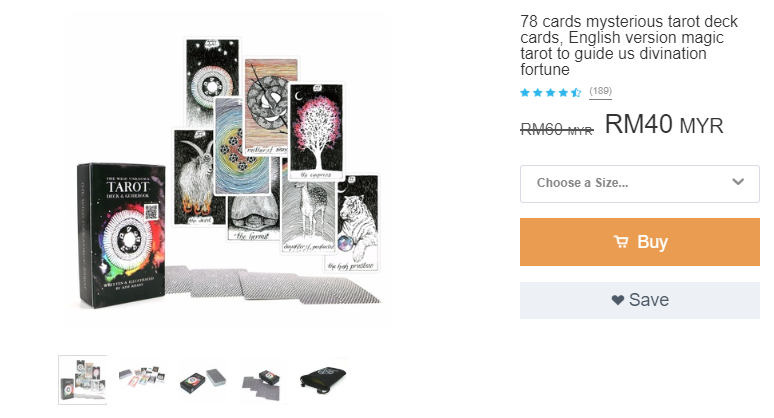 When purchasing a deck for more than RM100 on Lazada, be sure to always check the merchant as Lazada does have some originals on sale. 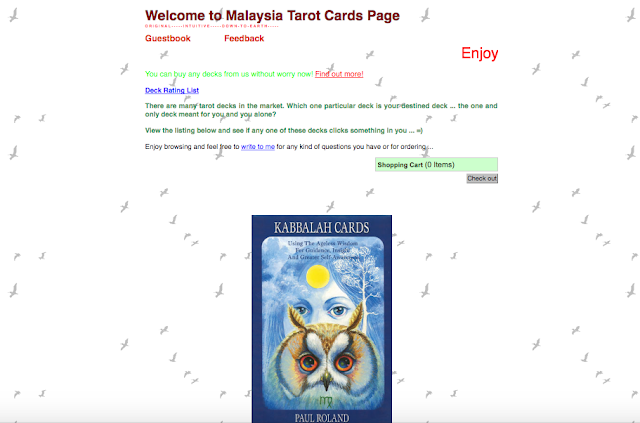 11Street is another online shopping website that has a good selection of Tarot decks for sale. However, the prices are extremely high in my opinion. As I don't even know if the decks on sale are authentic or not, it makes me pretty apprehensive about shopping here. If you're an avid shopper on 11Street and would like to help us fellow Tarot lovers, please feel free to leave a comment below. If you're interested in seeing 11Street's selection of Tarot decks, books, and accessories, click here. This website by far looks like the shadiest of the 5 I listed but on the contrary, TarotDeck.biz is where I got my very first Tarot deck from! The purchase process is very easy and the owner is very responsive to emails. He always quickly replied my inquiries after a few hours or a day. The downsides to this site are that there isn't much of a selection available and many of the Out of Stock decks seem to be Out of Stock permanently. I found 2 other websites that list an amazing range of tarot decks and oracle decks! 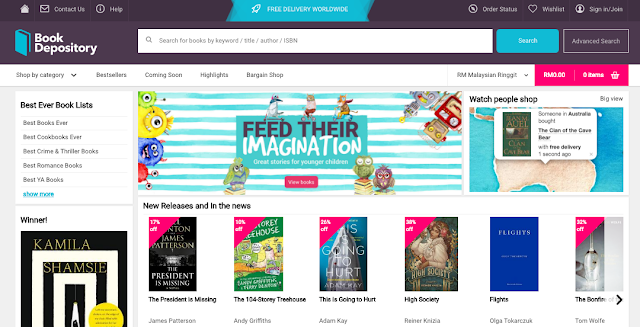 The Book Depository is a similar website to Kinokuniya. They sell a wide range of popular books, stationery and yes, tarot cards. My fave thing about The Book Depository is that they offer free shipping to anywhere in the world! No more pesky shipping fees!! I recently purchased The Wild Unknown Animal Spirit Oracle Deck (pictured above) for as low as RM96.51! The prices on the Book Depository fluctuate a lot and if you're lucky, they'll have a Book Depository promo code too! The only downside to this website is that since it's based in the UK, your orders will take a while to arrive. They estimate up to 2 weeks for your order to arrive, but mine arrived in about 3-4 weeks. Plus, they might not send your parcel to your office cause of customs. You might have to pick it up at the Pos Malaysia HQ near Pasar Seni (don't quote me on this). I don't have any information about them delivering to residences though. Wish.com is another great website where you can get tarot decks for a cheap price. I've seen a lot of YouTubers showing off their cheap hauls and decided to check it out myself. I was pleasantly surprised to find that they also sell tarot cards. However, I believe most of the tarot decks listed are not originals and may be published in different languages (don't be surprised if your deck is in Chinese). But to anyone who just wants to try getting into tarot on a budget, you can try these cheap decks. They even have copies of popular decks including ones from The Wild Unknown (which you can check out here or here) and the Shadowscapes Tarot (here). The other downside of this website is that shipping is a little costly. Depending on the weight of the item you're buying, shipping can range from RM7 - RM20. I hope this list was useful to you! I was contemplating adding eBay, Amazon or Etsy on here too but I wanted the list to just consist of easy to access Malaysian sites. If you found and purchased Tarot cards anywhere else online or offline, do leave a comment below and I will add them to the list!